If you’re looking to spice up your hairstyle without spending a ton at the salon, then do some at home highlights with all natural ingredients. With just a few ingredients from the kitchen, you’ll have a hot new look in no time. For beautifully lightened locks lemon juice is the way to go. Mix ¼ cup freshly squeezed lemon juice with ¾ cup water. Spray the mixture lightly onto your hair before going out into the sun. Make sure that you don’t get lemon juice on your skin or scalp, as it will cause you to burn and blister, however it’s totally safe for your hair. 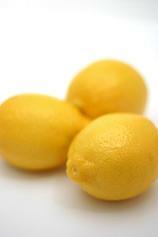 Leave the lemon juice on your hair for at least two hours, and make sure that you get plenty of sun. When you’re done condition your hair very well to avoid major drying. If your hair is already dry, and you want lovely light locks without turning your head into a broom, use olive oil to lighten your hair. By combing copious amounts of olive oil into your hair and spending an hour in the sun, you’ll have naturally lightened hair that’s also soft and silky. Results aren’t as instant as with lemon, so use olive oil in your hair at least three times a week until you get the shade that you’re looking for. Brunettes can lighten up their hair easily with a bit of chamomile tea. Make a big pot of chamomile tea and let it cool down to room temperature. Rinse your hair with the tea until it’s totally soaked in, and then hang out in the sun for at least half an hour. Unlike lemon juice or olive oil, chamomile tea is the least noticeable treatment, and it’s super easy on your hair. Use chamomile tea treatments every other day until you get the highlights you love. No need to buy expensive products or soak your hair in damaging peroxide. Lighten your hair naturally with these three common kitchen items, and get a gorgeous summer look – naturally! Discounts and specials on all our professional services. Up-to-date information on new cleaning methods & services. Information about our traditional and green cleaning products. Dry vs Steam Carpet Cleaning – Which Method is Best? Which Type of Carpet is Easiest to Clean? Paul Brown on Which Type of Carpet is Easiest to Clean?